Democrats will retake control of the U.S. House, launching a new era in oversight of the Education Department. As of Wednesday morning, ABC News projected Democrats would take 223 seats, and Republicans 201, with 11 seats yet to be called. We did it. Together. We did it. For education watchers, the biggest changes mean new chairmen atop the education policy and appropriations committees. Rep. Bobby Scott, a 13-term Democrat from Virginia, will take the helm of the Education and the Workforce Committee. He has long focused on civil rights and criminal justice issues, including juvenile justice. “While elections are defined by what makes us different, governing should be guided by the values and aspirations we share. The desire for access to a quality education, a good job, and affordable health care for ourselves and our families are universal values. I look forward to working with my colleagues to pursue a unifying agenda that will improve the standard of living for people from all walks of life,” Scott said in a press release Wednesday morning. Scott would replace current chair, U.S. Rep. Virginia Foxx of North Carolina. The biggest change could come in congressional oversight over the Education Department, particularly on its most contentious policy decisions, like those surrounding changes to regulations on for-profit colleges, Title IX rules governing how schools respond to sexual assault and harassment allegations, and a possible revision to school discipline guidance. Democrats’ legislative priorities, including college costs, childcare and early childhood education, and teacher pay, are a dramatic shift from Republicans’ hands-off approach to education, particularly K-12. Beyond oversight, an early item on Scott’s agenda would be a bill to create bonds and tax credits to help improve school facilities, Politico reported last month. The largest lift on the congressional to-do list is rewriting the Higher Education Act, though Politico reported it wouldn’t be among Scott’s first priorities. This Congress, a GOP-drafted reauthorization of the law never made it to the House floor, and efforts to rewrite it on a more bipartisan basis in the Senate HELP Committee fell apart. Several well-known names on the committee will be departing. Democrat Jared Polis won the Colorado governor’s election Tuesday, while, in an earlier upset, Republicans Todd Rokita and Luke Messer lost the GOP primary for Indiana’s U.S. Senate seat. Republican Education and the Workforce Committee members Dave Brat of Virginia and Jason Lewis of Minnesota lost their reelection bids, according to NBC News. 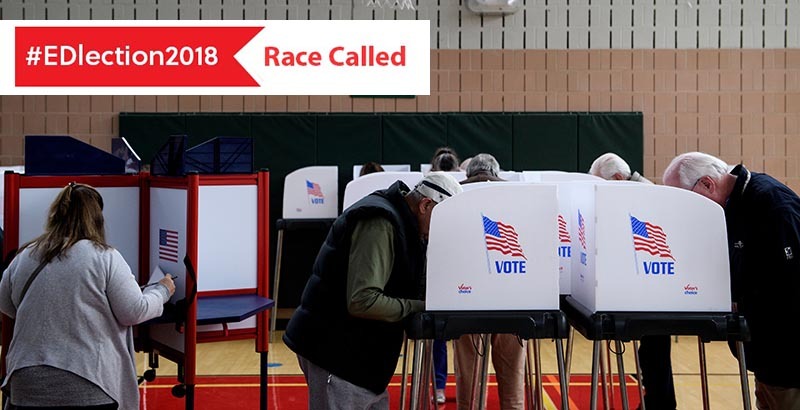 Rep. Karen Handel in Georgia was trailing her Democratic opponent, but her race had not yet been called as of 8:15 a.m. Wednesday. There will also be new leaders of the Appropriations Committee, Rep. Nita Lowey of New York. Rep. Rosa DeLauro of Connecticut will take over the subcommittee with jurisdiction over the Education Department. Both have expressed strong support for robust federal education funding, including opposition to the Trump administration’s proposals to cut major K-12 programs like Title II funding for teacher training or grants for afterschool programs. Also worth watching in the higher ed space is the Veterans Affairs Committee which, given its oversight of the GI bill and other higher ed benefits veterans receive, has played a pivotal role in the space, particularly the for-profit colleges. Rep. Mark Takano, Democrat of California and himself a former teacher, is likely in line for the chairmanship. 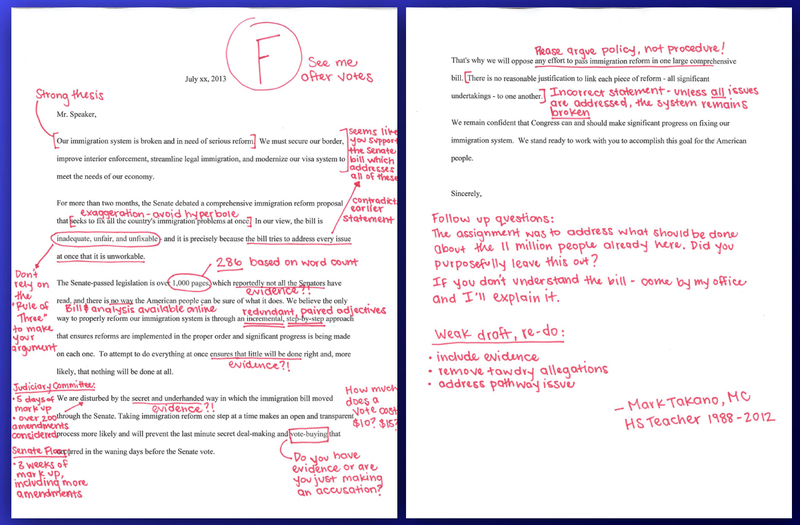 He made waves in 2013 by sharing a letter from Senate Republicans on immigration reform that he had graded — it got an F.